The Classical concert by Dr.K.J.Yesudas on Oct 1st, 2012 at Anathapuri Auditorium (Jagathy) was a dream come true for many when the Celestial Singer came down heavily with his musical Midas touch to please all the serious musical lovers at the capital city. It was indeed a special occasion for the singer too who was performing for the 36th successive year in Soorya festival. Adding to the glory was yet another feat of his completion of 50 years in playback singing. The event marked the opening ceremony of the dance & music festival. The event started off with an address by the organizers reading out a special note handwritten by Lata Mangeskar congragulating Dr K.J.Yesudas for his glorious 50 years of musical expedition. The singer got a standing ovation when he entered the scene though it’s nothing more than a cliche for a singer with this stature. With an introduction and a humble note to the audience Dassettan reminded that he is still a student in the ocean of music. He praised Soorya Krishnamoorthy for conducting the events for more than three decades in an elegant manner. 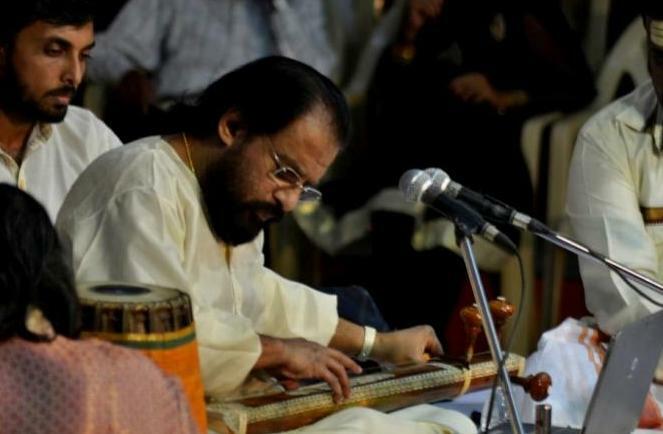 Yesudas was accompanied by Mahadeva Sharma (Violin), Changanassery Harikumar (Mridangam) and Thripoonithra Radhakrishnan (Gadam). Started off with the Om sthuthi and Sree Ganeshanatha keerthana. Then it was purely a divine experience for all. 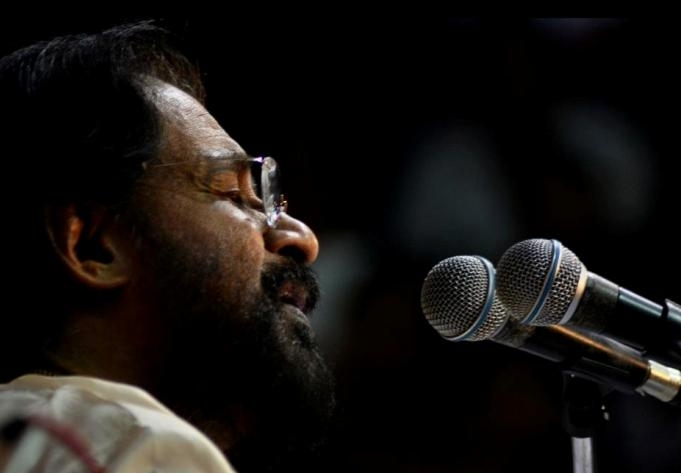 With the perfect backing from the accompanied musicians the concert was in full flow with intermittent interaction by Yesudas (mixed with Tamil & Malayalam) with the audience to make sure he connected well with them. Crowd enjoyed some light moments too during instances when he called Soorya Krishnamoorthy through the microphone referring to the rising temperature inside the hall. The reference he made to a raga for which three different names were credited by different musical connoisseurs was informative. Then followed the Pakkala, Alai paayuthe, and a beautiful ode to Lord Ganesha along with few popular ragas. Recently recorded Dakshinaamoorthy’s composition ‘Thampooru naadagaanadwaniyil’ was rendered as a tribute to his master. The Hindi song Shadjane Paya Yeh Varadan from the unreleased Hindi film Tansen composed by Ravindra Jain was rendered with ease which showcased the great medley of different ragas put together. When the traditional Harivarasanam was recited the whole crowd joined to the tunes with that being the one very close to their hearts. The concert came to an end after two more renditions. All present at Ananthipuri auditorium during this musical extravaganza were experiencing the divine music in its purest form from the legend and it left no one shy away from tapping the feet or nodding the heads according to the rhythm. One of the finest singers of our generation was exploring the various ragas in great style. It was yet another proof that he is indeed one of the great ambassadors for classical music with the popularity he enjoys in the Indian music industry. Gifted with a voice that can traverse the three octaves with effortless ease and having timbre and magnetic pull, he maintains this with his commitment and sheer hard work. Singer admitted that it is because of his ultimate sacrifice by refraining from many distractions, that makes him sing at this age without serious issues for the breath control. ‘Ganagandharvanu Sooryavandanam’ — an exhibition of photos and news clippings of Yesudas coordinated by Alex Vallikunnam was held showcasing the singer at Soorya festival during the last 36 years. It made many fans revisit those glorious moments and also the Singer had a walk down memory lane.